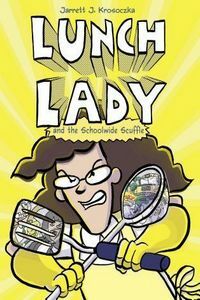 Lunch Lady and the Schoolwide Scuffle by Jarrett J. Krosoczka: Synopsis and Online Purchase Options. Synopsis (from the publisher): Lunch Lady and Betty have been unceremoniously cut from the school budget, and the timing couldn't be worse — the villains from all nine of her previous adventures are worming their way back into Thompson Brook with a masterfully devious plan. Will the Breakfast Bunch still be able to count on Lunch Lady's superhero gadgets and abilities to save the school, or are they on their own? Don't miss Lunch Lady's swashbuckling finale!